BELOW (left) Colin, (right) Dallas with their 1st place trophies. Todays Box Jump - 62"
WHAT DOES DALLAS DO ON RACE DAY TO PREPARE FOR A RACE? 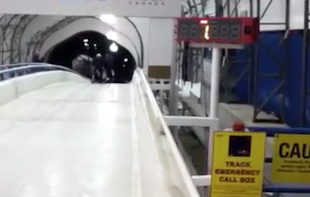 As athletes from all over the world prepare for those few seconds that determine where they stand in the world of bobsledding.... They can prepare themselves in every way they know how but ultimately it comes down to their speed with a 600lb sled in front of them. It doesn't matter how big the quad or hamstring, it doesn't matter what energy booster they take before the race...what does matter is the unity of the team, the ability to get the sled moving the fastest from initial hit and then the rest is up to the driver. This is something that Dallas has proven over and over, that he is able to give the driver the initial start needed to get the sled moving and up to the speed needed for the fastest downtime possible. 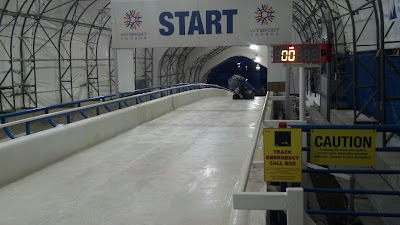 Ultimately Dallas has an intense warm-up and stretching regimen that gets his body ready and at its peak for that burst of speed for the 3-5 seconds of high speed pushing that gets the sled moving, at the start of the race, as fast and smooth as possible. 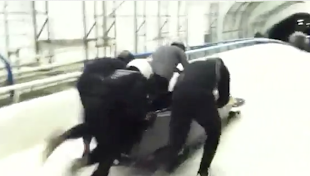 Another aspect that comes into play for a bobsled team from any nation is the quality of equipment in comparison to the other teams in the race. 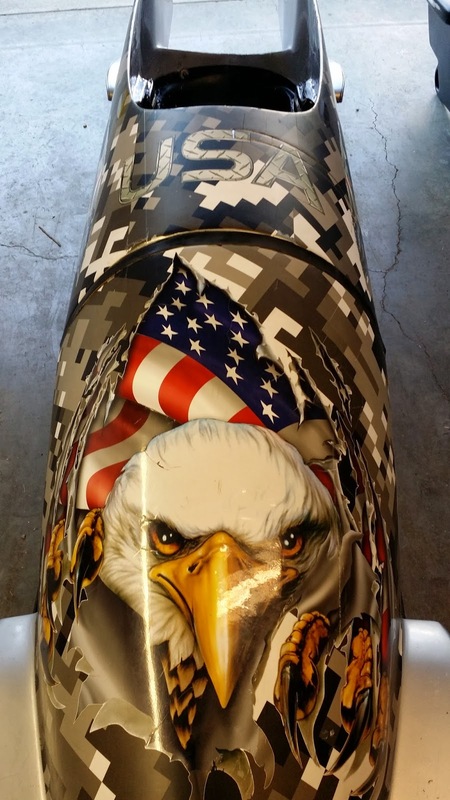 To even out the playing field of sleds would change the world of bobsledding forever. This is a topic in and of itself. 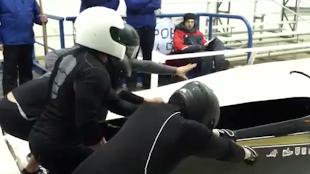 In January 2014, Dallas and his team raced in the Europa Cup Bobsled Circuit against 60+ teams from all over the world, many of which are racing at the 2014 Sochi Olympics. Thanks to Codi Bascue (driver), his coach Craig Bascue (Dad), and Dallas's sponsors for making this opportunity possible. 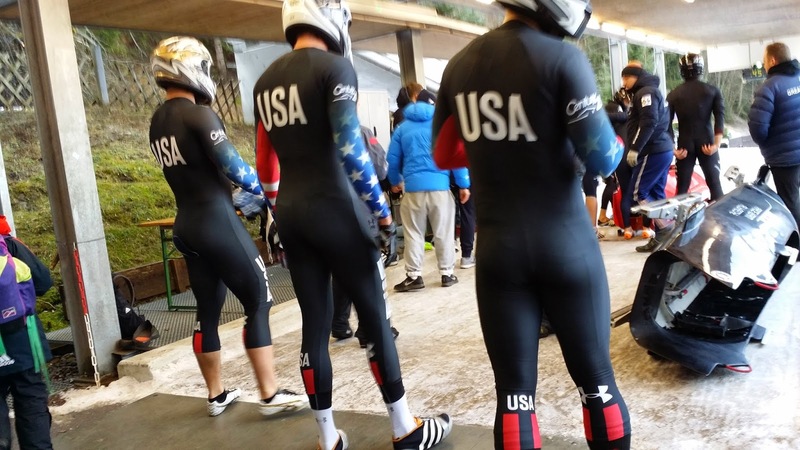 Dallas's first 2-man race in Igls, Austria as the brakeman for Codi Bascue (USA Team 4) on Day 2 of the races. Because of a great start time & great driving by Codie, Dallas assisted Bascue in moving up 11 spots from 27th place on Day 1 to 16th place on on day 2. The 4-man team took 19th overall (out of 60 sleds) in all 4 races in Austria and Switzerland. St. Moritz, Switzerland. Dallas getting ready to race. St. Moritz, Switzerland - Dallas and team at the bob start. St. Moritz, Switzerland - Dallas and team at the finish of St. Moritz bob run. All information on this site is owned by Dallas Irvin and you must have permission to use it or publish it in any other publication. Dallas and Bobsled Driver Collin Coughlin race today in the 2Man Bobsled races in Park City, Utah. Collin coming off of a hamstring injury and Dallas have been training togaether for the last few weeks. Today was Collin's first day running at full speed for the push start. Their start times were great and the final down time impressive. Good Job Dallas & Collin! See Bobsled starts for both heats below. Look how cool this bobsled is! 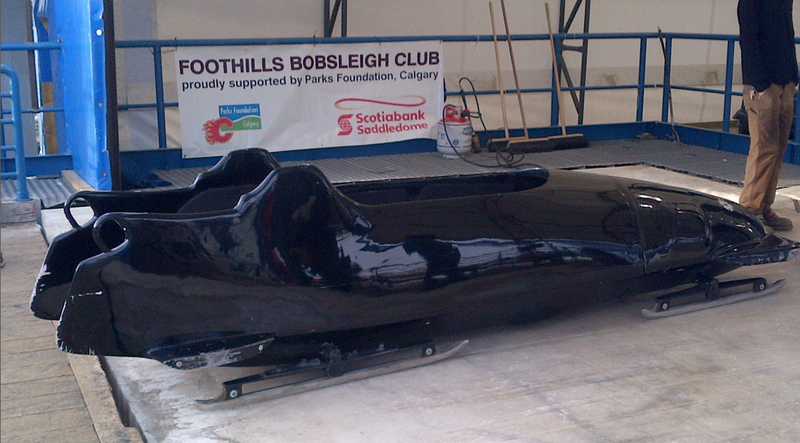 Dallas's & US Driver Colin Coughlin are using this 2 man sled for this Bobsled season. Go team! 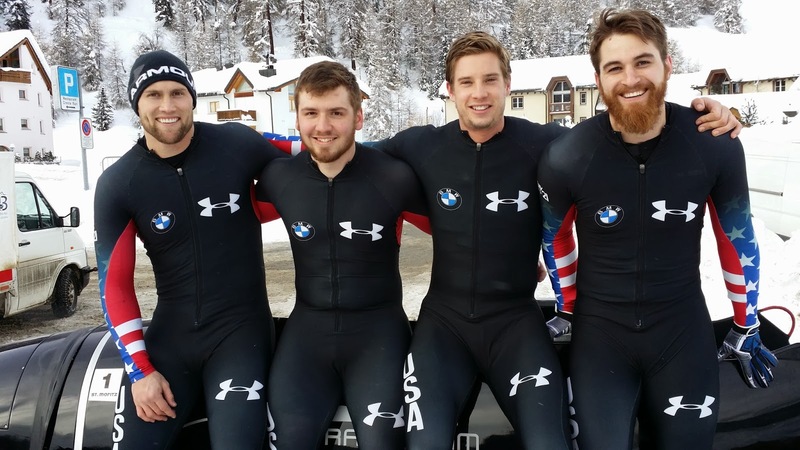 Dallas will be in Park City, Utah almost every day for the next month with the exception of Sundays and Mondays, training as a member of the USA Bobsled team. He is also continuing gym training as usual. TRAINING NEVER STOPS: Summer training for any of the US Bobsled/Skeleton athletes consist of a lot of self motivation and dedication. Wether the athlete lives at the OTC or trains in their perspective hometowns, it is vital to keep the gym training and speed training schedule management in line to be ready for the personal and team trials that put the athletes in their positions for the upcoming winter season. Dallas's schedule consists of daily gym training accompanied by speed training at American Athlete in Lehi, Utah. If you are really interested to know what Dallas eats, feel free to email americanathleteutah@gmail.com for a full meal plan. But basically Dallas likes to "EAT & TRAIN". This means he eats a lot. He is constantly eating high protein meals along with vegetables and some fruits. He also supplements his meals with extra protein, creatine, glutamine, BCAA's, fish oil, multivitamin and occasionally a pre workout if needed. IN THE GYM: While in the gym most of his workouts are, by most people the most dreaded workout- LEG DAY. "feeling the burn" isn't as easy as it used to be. Getting sore after the gym is something Dallas strives for so he knows his body is reaching higher levels. While leg day is his favorite day, he also does full range of functionality movements & cardio and stretching to keep the all over physical condition at its best. Dallas opened a gym called American Athlete in Lehi, Utah. Feel free to stop by and visit and view his training programs. January 2- Feb 3, 2013, Dallas spent his time eating, sleeping, training and pushing sleds at the Olympic Training Center in Lake Placid New York with the US Bobsled team. Gaining over 15 pounds of muscle and fine tuning gym & pushing techniques, Dallas is less than 6% body fat. 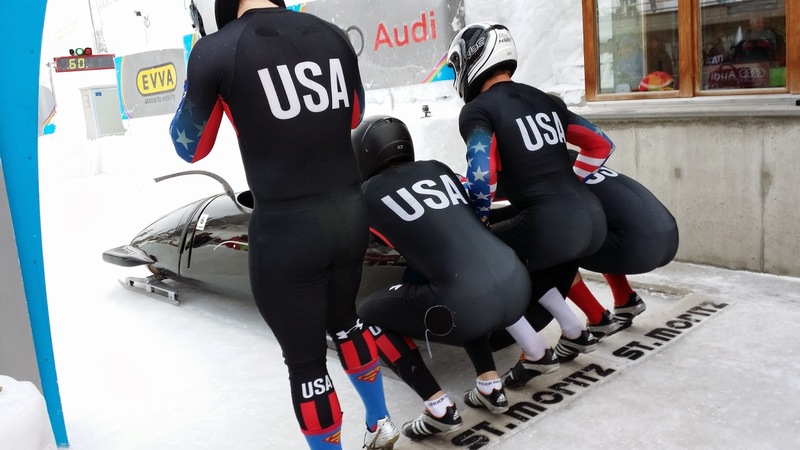 Looking forward to a US Bobsled Combine in the next month and Push Track Championships in the fall of this year Dallas is back in SLC training daily at the Park City Olympic Park and at a local gym. Anyone that knows Dallas knows that he is an exceptional athlete, setting records no matter what sport or league and never settling for 2nd best... and now, prepared for the unexpected opportunity of a lifetime. As noted previously in this blog, Dallas has been training and sacrificing much to be in top physical condition and ready to dominate in one of his favorite sports....football. 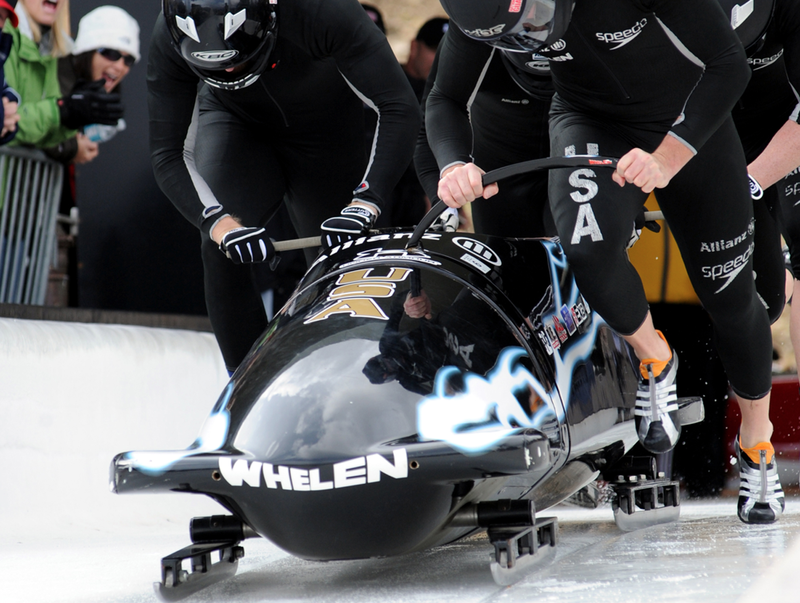 But when Olympic Driver, Jay Noller, invited Dallas to Park City, Utah to push his sled... a whole new world was opened up to him. Dallas having never pushed a sled in his life, proved his ability to learn fast and continued doing what he has always done...dominate. 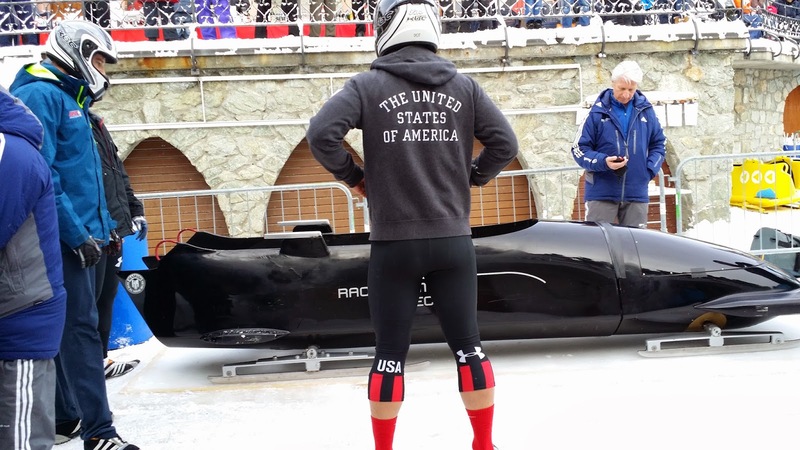 Dallas has always been a big fish in a small pond when it comes to sports and is now on a journey of a lifetime with a goal in sight to be at the 2014 Winter Olympics in Sochi Russia on USA bobsled driver, Jay Noller's, team. Not only did Dallas and football teammate Aaron Lesue' take 2 positions on Jay Noller's 4 man team but they took the place of two of Jay Noller's long time team members. 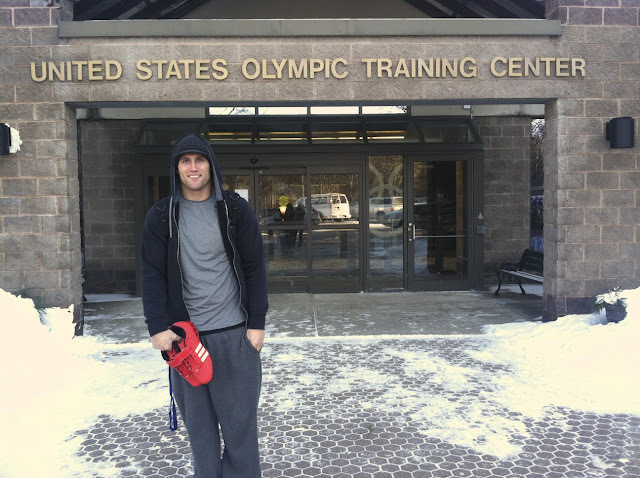 On Saturday evening, November 10, 2012, Dallas was given one day to travel to St. George, pack his home and get his wife and 3 kids moved to Salt Lake City by Monday morning to be closer to the Olympic Park where most of his off tour training will be done. 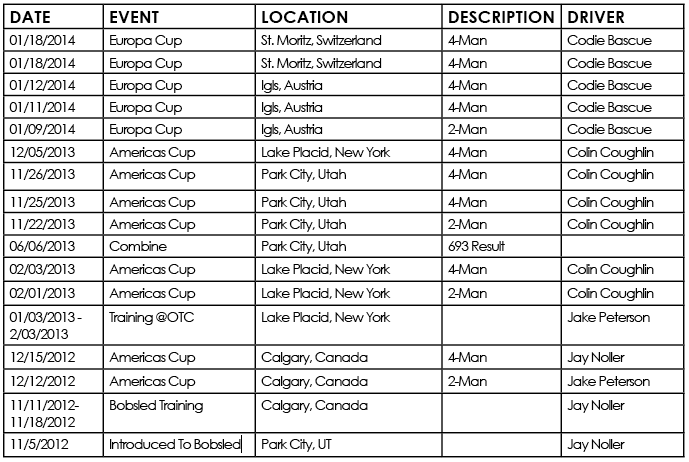 After the move Dallas had one week to prepare for the American Cup Tour through Canada which is preparing the team for the Olympic trials in 2013. Athletes preparing for the olympics must dedicate 100% of their time training on and off the ice. Unlike other countries including Russia, China, Germany and Canada, Olympic Athletes are not government funded; leaving these athletes with no time to provide for their training, equipment, travel to races, everyday living expenses and insurance costing upwards of over $200,000.00 per year. Support from family, friends and others is very much needed, appreciated and time is of the essence. 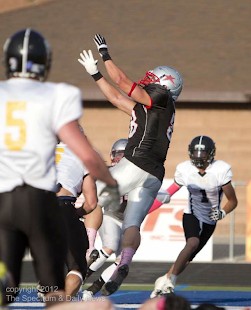 Highlights from the 2012 season with the RMFL. Dallas came back to play with the Rebels for the last 5 games of the season. You will see magic happen when he is on the field. But Dallas always gives credit to his teammates because he knows that it's definitely a team effort in for each and every play. Dallas had a total of 12 receptions and 6 of those were receiving touchdowns. Unless you are a mathematician you might not be able figure out that he scores every other time he has the ball thrown to him. That usually makes a player somewhat valuable to a team. Other teams and players have expressed that if Mr. Irvin was on their team, he would be getting the ball thrown to him A LOT! 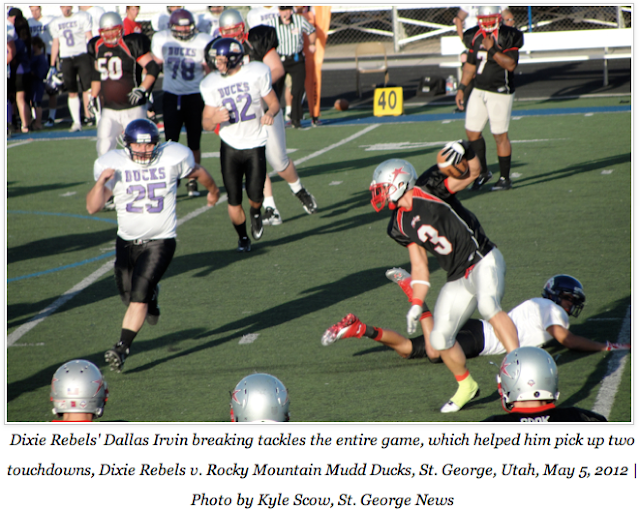 The Dixie Rebels headed into the playoffs Saturday night ready to show the Rev how to play...again. But the Rev came prepared this time as they faced the Rebels on the scorching hot field in heat of Southern Utah. The Rebels had one field goal by Pulver and one touchdown by Dallas ending the game with a score of 10-16 Revolution. The Rebels were looking forward to facing the Utah Shock in the Championship this year but the losses of both teams in the semi-finals brought the season to an unexpected end for them and their fans. Click here to view the latest news article. The Dixie Rebels Defeat the Utah Shock yet again tonight June 2, 2012. It was an exciting football game that kept the crowd on the edge of their seats up until the last minute of the game. Now the Rebels secure home field advantage for the the rest of the season. Thanks to the staff that organizes the Dixie Rebels event for having Victoria Sing the National Anthem and the great cheerleaders and dancers throughout the entire night. The Dixie Rebels know how to entertain! ST. GEORGE SPECTRUM NEWSPAPER - With their starting quarterback on the sidelines for the entire second half after suffering an ankle injury, the Dixie Rebels didn't miss a beat. Still awaiting the arrival of his jersey with "ocho ocho" on the back, Dallas wears an absent teammates jersey #3 to assist the Dixie Rebels defend their home territory against the Rocky Mountain MuddDucks Saturday night. A quick look at Dallas Playing Wide Receiver/Slot for the 2012 Dixie Rebels. 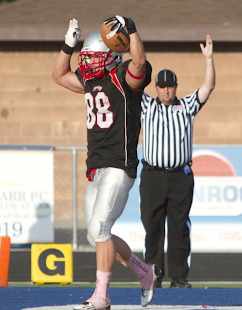 He's having fun playing with the Rebels while he is training and working to get a position with a professional team. Dallas sets the mood for the game with the first play of the game...60 yard pass to a TD. One touchdown was not filmed due to technical difficulties during the game. One thing that Dallas has proven OVER AND OVER is his consistency in being the best. He puts 100+% into everything he does, even though his 80% is better than most peoples 100%. Reflecting back on all of his stats through-out his playing time and film, he dominates the field at every position he has played. In my years of coaching, I have come to know from experience that the players with experience in multiple positions are always my top players. 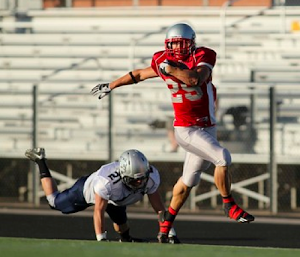 He has received awards such as 2011 Rushing & Scoring Champion for the RMFL Semi-Pro. Male Athlete of The Year, All State Running Back, holds the Record for the 400 in Track, 2nd in State for Javelin, Utah State Record: 41 carries in a single game & the Mr. Hustle award just to name a few. Watching Dallas play and train has opened my eyes to the type of person he is. He is the guy that is first to practice and last to leave. He is the guy that asks what he can do more than what is already asked of him. He is the guy that helps others progress along with him. He is the guy that gets in, get the job done, and gets out. He is the guy that, even though he is already the best of the best, is humble enough to listen and learn. There is a reason that every time Dallas steps onto the field something magic happens... Dallas Irvin is one of a kind. Check out "Latest News" tab to read about Dallas at the Esks workout last Saturday. 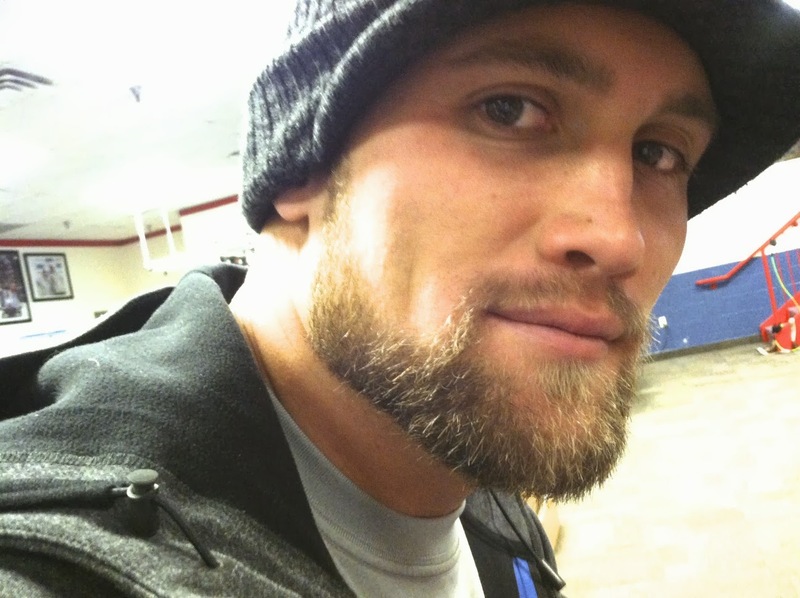 Dallas Attended a workout for the Edmonton Eskimos on April 14, 2012 in Anaheim, CA. He was one of less than ten running backs and over sixty athletes. The tryout was well organized but Dallas quickly realized that the Esks were not on the hunt for a running back. It was obvious they were scouting for a wide receiver and being that there was about 40 wide receivers trying out he was not the center of attention. When the head coaches timed Dallas in the 40 yard dash and saw his cone work times, they wanted to see more. They asked him if he had ever played any other positions and if he could play wide receiver. Dallas has a lot of experience and was ready to show them his value. Dallas's times on his cone work & drills were top notch which would excite any coach looking for a Reggie Bush style player that is versatile and can adjust in any situation bringing the team out on top. The last workout for the athletes was receiver routes. Dallas hung with the best of them and by the end, 8 players were selected (including Dallas) to stay and do more focused receiving routes for the coaches. Wide receiver is a great position for a guy like Dallas because he is fast, knowledgeable and has lightning fast reaction speed. Esks would be smart to have a player like Dallas as an addition to their team. Dallas has decided to jump in with the 2012 Dixie Rebels mid-season, but this time as a Slot Receiver to show interested teams his versatility. He has dominated the field for the Rebels since he started playing as you can see in the videos posted after each game above. One of my good friends Tammi Swanson (photographer/business owner) works with the Elan Magazine Editor and Founder Darci Hansen. We have been working on an article about the local MMA Crown Fighting Championships for the Men's Issue coming out in early January 2012. This morning we met 2 fighters and the founders of the CFC (Scott Ford & Aaron Reis) at Reis's Fusion MMA Gym to do a photoshoot for the Article. The fighters were spray tanned and dusted with a era decent powder that gave them an unmasculine feeling but a very defined masculine look for the shoot. Dallas was also shot by Tammi to get some good pictures of him to submit with his Combine Player Profile. He is a natural in front of the camera. It was amazing to watch him and to see the photos Tammi captured of Dallas, they were incredible! This is just a "sneak peek" photo I took with my phone. Dallas has the opportunity to train at the Athletic Republic Facility 3 days a week. The Facility is just at the bottom of the hill from our house, which makes it super convenient. Athletic Republic is a sports training facility that has the latest in science & technology and 20 years of heritage creating a very precise program to assist self motivated athletes, like Dallas, to reach their top performance ability during a 3 session per week - 9 week program. The first day of training at Athletic Republic Dallas set the record for the fasted 20 yrd dash out of thousands of other athletes in the Athletic Republic data base of 20 years. He never ceases to amaze me in his motivation to be a top performer. Throughout my experience of Dallas he has proven that quality over and over. He will go to great lengths (if needed) to be the best, the fastest, the strongest. He desires to break the record and hold it. The COOLEST part about that great quality he posesses is that its not only on the field or in the gym, but he desires that in all areas of his life. He is a great friend, dad, husband and teacher. He is very passionate about everything he is doing, no matter what it is...cooking, reading, hanging christmas lights, fixing up an old basketball hoop or playing flag football or softball with buddies. 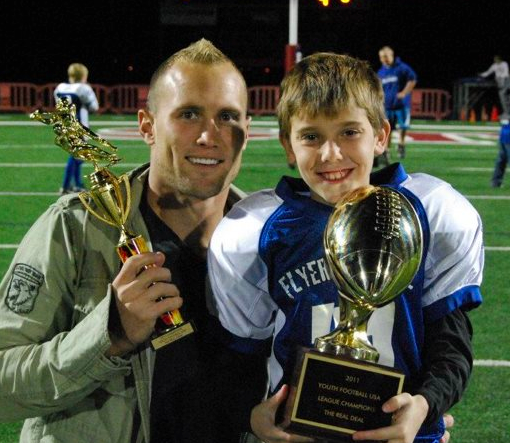 This picture was taken after our son Diego's championship football game held at the Hansen Stadium on November 12, 2011 in St. George, Utah. 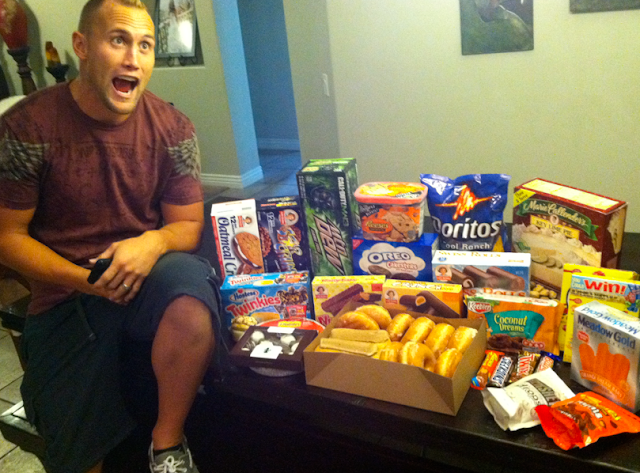 Dallas eats high protein and carefully counted out carbs for 7 meals a day. ZERO SUGAR. No candy. no treats. nothing. It's full time employment to eat 7 healthy meals a day. Grocery shopping takes longer, preparing the meals take longer, and eating takes longer. Then after 6 weeks of this healthy dedication...SUGAR DAY ARRIVES. 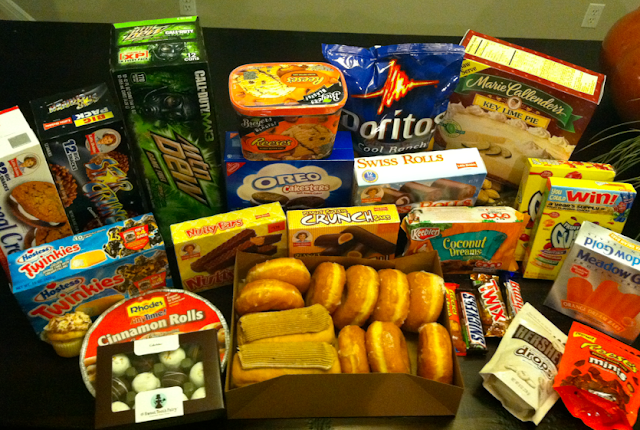 We carefully but not limiting any fat or sugar filled the cart. 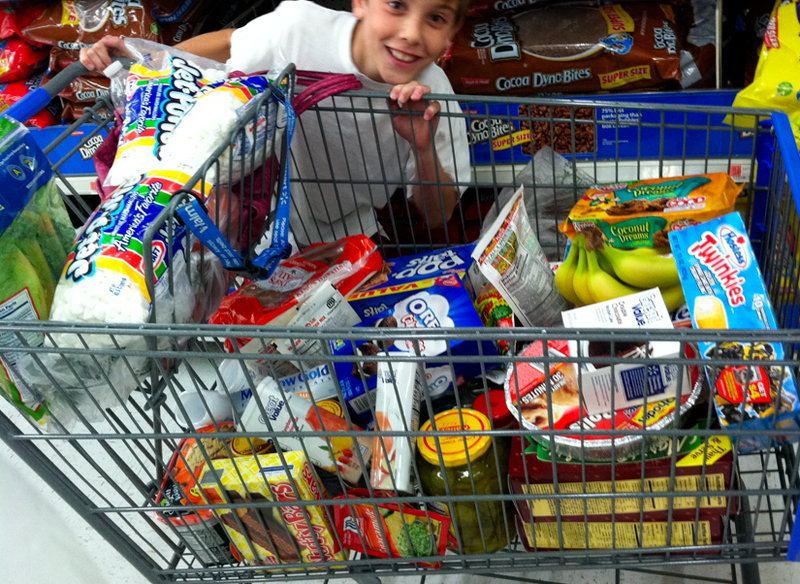 If you see anything in the cart that is healthy...it isn't for Dallas to eat on his Sugar Day...Sugar Day is ONLY SUGAR. Our bodies get used to eating "healthy" and doing the workouts performed routinely, basically plateauing and holding your body back from getting bigger, faster, stronger. Hence the sugar day. To learn more about The Sugar Day Contact Jeff Schuman creator of the Titan 1000 Challenge, Personal trainer. Today Dallas completed the 1000 LB Challenge. The 1000 LB Challenge has been around for a long time. It is when a person does a Squat, Dead Lift & Bench Press totaling 1000 lbs or higher when combining all three exercises. Dallas is on a very strict diet and workout regimen that I will write about soon. The cool thing about Dallas is that he has NOT taken any hormones or steroids to help him accomplish his goals. Everything he is doing is ALL NATURAL. He is very strict with his diet and workouts insomuch that he is ready for his SUGAR DAY which will shock his system and take him to the next level. His next 1000 LB challenge will be fun to see the difference in weight. SUGAR DAY is coming soon check back!!!! The times recorded below are Dallas's first ever attempts at the Shuttle and 3 Cone Drill. 5- 4.08 major slip on left side. 7- awesome run- great form. But timer didn’t get it. Training with Cody Fonnesbeck is an awesome experience. He is knowleadgable and experienced in football & track. Dallas is training to better his running & work out form and technique. Dallas has the natural talent and ability that makes him a coaches dream. He is able to listen to the constructive criticism that takes him from a top 10 runner to a top 5 runner in one session. Because of Dallas's dedication and desire to be the best, I predict that he will be in the top 5 at the 2012 regional combine if not #1 in most of the work outs that he performs. All information on this site is owned by Dallas Irvin and you must have permission to use it or pub. Awesome Inc. theme. Powered by Blogger.